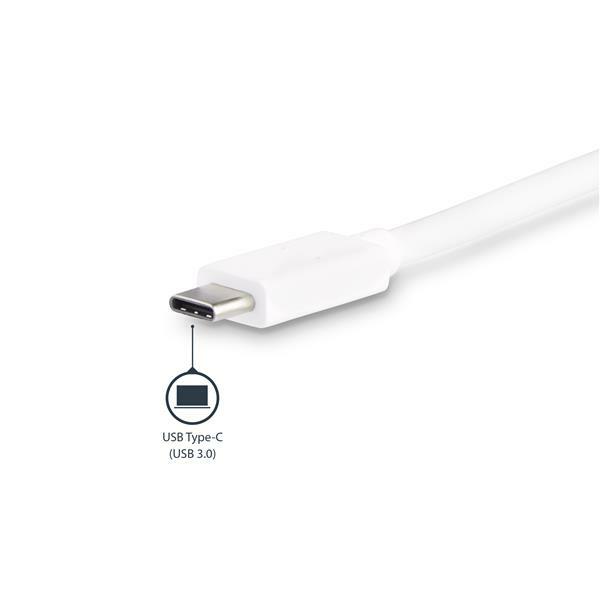 Expand the connectivity of your USB-C™ enabled laptop. 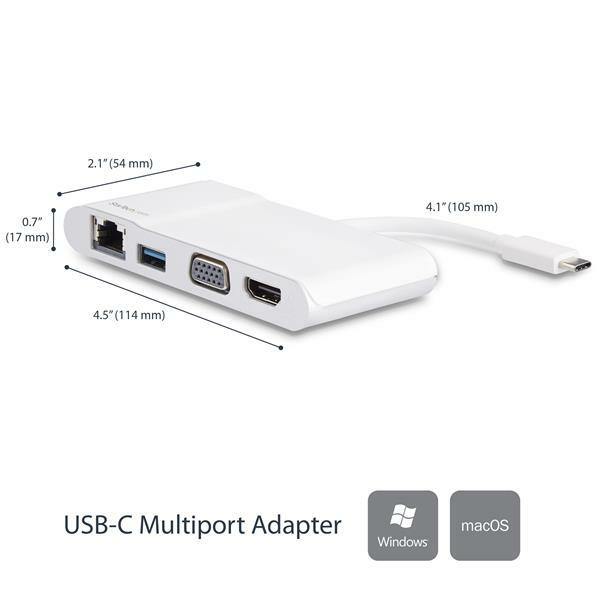 This USB-C multiport adapter lets you turn your laptop into a powerful workstation, virtually anywhere you go, eliminating the hassle of carrying and connecting many different port adapters. 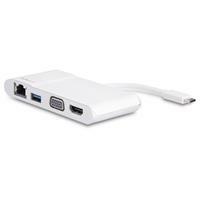 This 4-in-1 adapter lets you add 4K Ultra HD HDMI® or VGA video output, one USB 3.0 Type-A port, and one Gigabit Ethernet port through your laptop’s USB-C port. 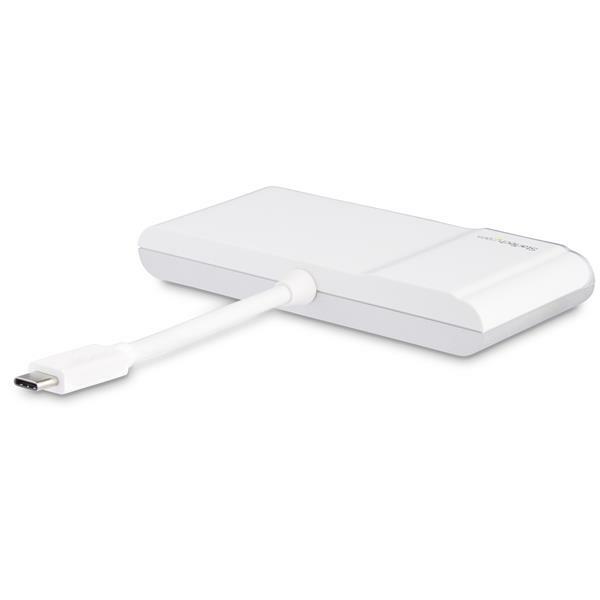 It’s the perfect travel accessory for your MacBook Pro, Chromebook™, Dell XPS, or other USB Type-C™ equipped laptop, giving you the most common video outputs plus other essential added port options. It features a sleek white and silver design that looks great next to your laptop, and it’s also Thunderbolt™ 3 port compatible. 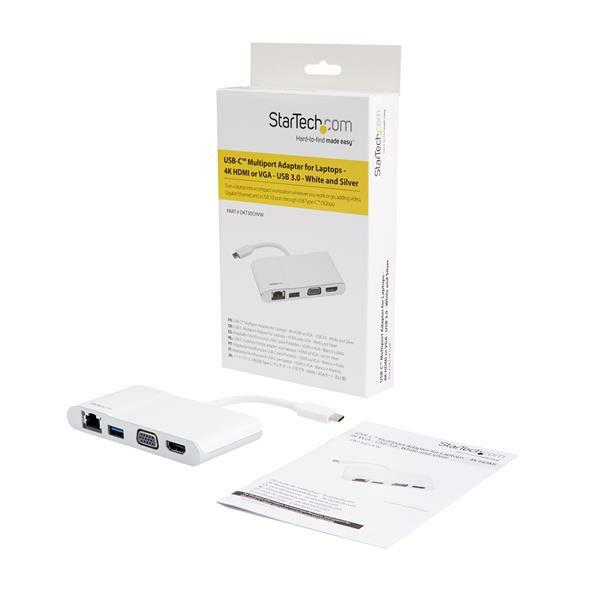 The multiport adapter enhances the connectivity of your port-limited laptop, giving you the ability to connect to multiple devices simultaneously. 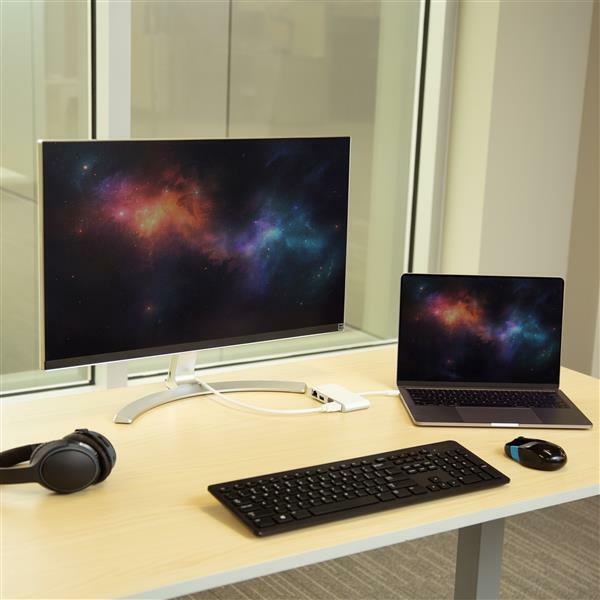 When coupled with your laptop display, this versatile USB-C multiport adapter makes it easy to create a powerful workstation. 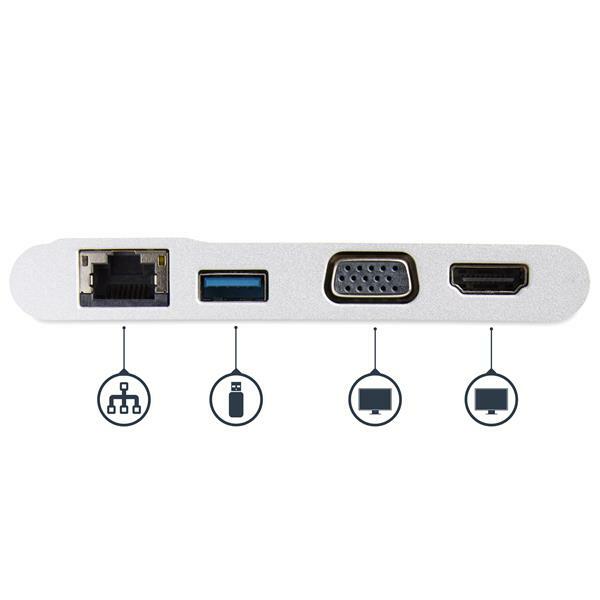 The USB-C multiport adapter provides HDMI (with audio) and VGA ports, so you can easily connect a 4K HDMI or a standard-definition VGA monitor. Connect a high-resolution monitor to deliver engaging presentations in boardrooms, classrooms, and conference rooms. Use an HDMI port-equipped television in a hotel room as an external display when traveling. The option of VGA video output means you can connect easily to legacy VGA projection systems or monitors when you need to. The Gigabit Ethernet port ensures reliable wired network access, ideal for areas with limited Wi-Fi availability. This compact multiport adapter is USB-powered, so there's no need to carry a separate power adapter with you. It provides both HDMI and VGA video output, giving you the flexibility to adapt to newer and older boardroom setups as needed. The adapter also features a built-in USB-C cable and gives you network connectivity and a USB Type-A connection for optimum versatility as you travel. The DKT30CHVW is backed by a StarTech.com 3-year warranty and free lifetime technical support. For MacBook host systems using macOS 10.12, version 10.12.6 or later is required to support this product. Note For MacBook host systems using macOS 10.12, version 10.12.6 or later is required to support this product.